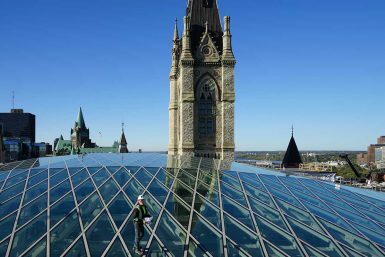 News | West Block Rehabilitation Project’s First Session | Front Inc.
We are pleased to announce that the West Block Rehabilitation Project recently held its first session of the House of Commons in Canada! Front collaborated from Schematic Design through Construction Administration with Architecture49 and EVOQ Architecture. Front helped to inform the design and to produce the performance based contract package as well as the the Building Information Model (BIM) of the Infill Roof systems. The project utilizes a double skinned, ventilated skylight with integral solar tracking louvers and a maintenance platform for acute modulation of natural light to production quality levels on the interior of the chamber, which is housed within the courtyard of a load bearing masonry building from the mid-1800s.